As the gateway to Vermont, this most charming and historic town sits quietly in the valley along the southwestern corner of the state. With a population of approximately 15,700 people, you might be surprised that Bennington is the largest town in the southern part of the state and the third-largest in all of Vermont. Incredibly rich in history, this town is the home of the Bennington Battle Monument, commemorating the Battle of Bennington, an important and instrumental battle of the Revolutionary War. Fought on August 16, 1777, the actual event took place just 10 miles over the border in Walloomsac, New York. A site worth your time to see. 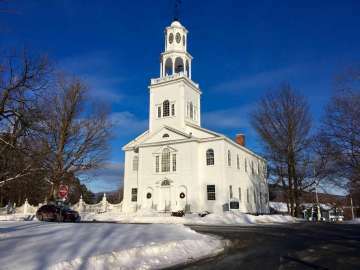 While you are here, be sure to take a walk over to the Old First Church in Old Bennington, the most beautiful church in all of New England (at least we think so). Wander through the historic cemetery with graves dating back to the mid 1700’s. 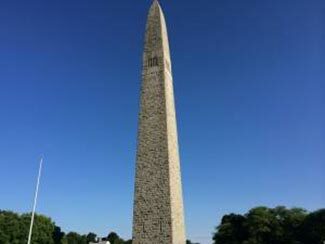 It is the final resting place for a number of veterans of the American Revolution, as well as the poet, Robert Frost. Just a few steps away is the Bennington Museum, home of Grandma Moses’ schoolhouse and the largest collection of her paintings. An accredited museum featuring notable art and regional history. Historic downtown Bennington is home to Oldcastle Theater, The Bennington Pottery, The Village Chocolate Shop, Madison’s Brewery plus many more locally owned shops, cafes, and restaurants, too numerous to list. Be sure to stop by our Visitors Center for maps and suggestions of places to visit. Need some adventure? Not far from downtown is a trailhead for hiking in the Green Mountains. The Long Trail and Appalachian Trail overlap each other just to the east of town. World famous Prospect Mountain is THE place for cross country skiing and just a short drive east of town. Covered Bridges, trout streams and rivers, views of the mountains. History, nature, peaceful and quiet. No traffic, no crowds, fun places to visit. Great cafe’s and restaurants, craft breweries, and gallons and gallons of maple syrup. Snow in the winter, fiery foliage in the fall. Cows, deer, wild turkeys, and bear. Whew!!! Just come for a visit. Come see first hand and you may find yourself dreaming of a life right here in Bennington.